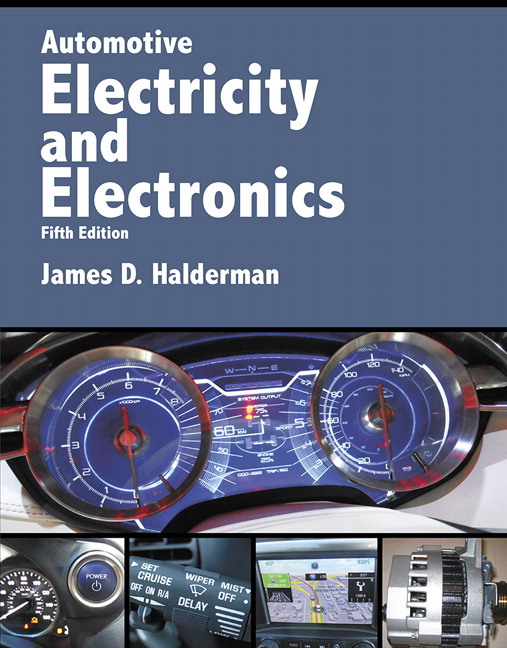 This book is part of the Pearson Automotive Professional Technician Series and is designed to be a two-semester text and covers the fundamental, as well as, the advanced electrical topics taught in all schools and colleges that teach automotive electricity and electronics. 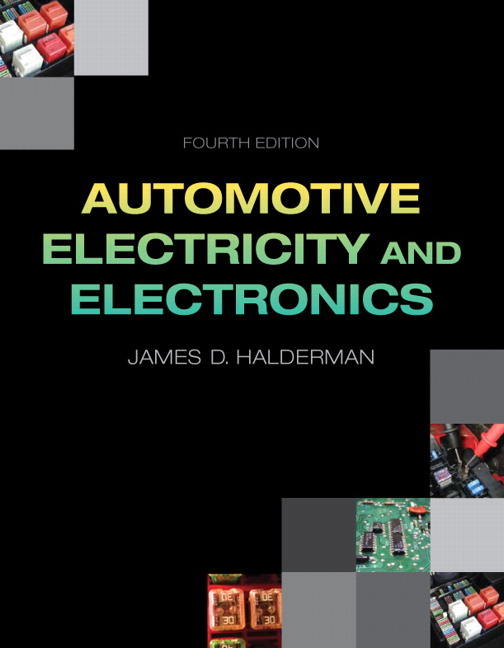 Automotive Electricity and Electronics, 5/e, provides complete coverage of the parts, operation, design, and troubleshooting of automotive electricity and electronics systems, as well as the practical skills that students must master to be successful in the industry. Real examples and full color images throughout the text offer readers a practical approach to the diagnosis and repair of the NATEF tasks for the Automotive Electricity/Electronic Systems (A6) content area. Formatted to appeal to today's technical trade students, Halderman uses helpful tips to bring concepts to life and guide students through the procedures they'll use on the job. To keep your course current, all of the content is correlated to the latest NATEF tasks and ASE areas, and information on new OSHA hazardous chemical labeling requirements, three-legged and low profile fuses plus smart junction boxes, and immobilizer systems is included. NEW: New OSHA hazardous chemical labeling requirements are included in Chapter 2. UPDATED: Additional explanations about electrical circuits are included in Chapter 4 to make learning this important topic easier to understand. NEW: New content on three-legged and low profile fuses plus smart junction boxes is included in Chapter 10. NEW: New content on immobilizer systems is included in Chapter 26. Present topics in short, easy-to-read chapters. Automotive Electricity and Electronics makes teaching and learning easier by breaking the content into small, manageable segments. UPDATED: Deliver the most up-to-date standards content. All content in the book has been updated and correlated to the latest NATEF tasks and ASE areas. UPDATED: Visualize concepts with full-color photos and line drawings. Over 60 new full-color photos and line drawings are included to make the subject come alive. The photos show the actual parts involved so that the student can view a good or defective part. The line drawings allow the reader to see what is inside a component and how it works. Make reading, studying, and content mastery easier. Every chapter includes bulleted and numbered lists to summarize concepts or the steps in a procedure, while the design for main and sub-headings makes it easier to grasp the scope of the chapter. Finally, each chapter ends with a Summary, Review Questions, and a Quiz. Answers to questions can be found in the Instructor’s Manual. Real World Fix boxes present students with actual service scenarios and show how the problems were diagnosed and repaired. NEW: Case Studies in this edition include the “three Cs” (Complaint, Cause, and Correction) to reflect what is done in the real world in dealers and shops. Supplement your course with a full instructor support package. To make teaching from this text easier, textbook adopters have access to a TestGen computerized Test Bank, image bank, and presentation slides. Get up and running quickly using the Instructor’s Manual.The Instructor’s Manual contains chapter summaries, key terms, chapter learning objectives, lecture resources, discuss/demonstrate classroom activities, and answers to the in-text review and quiz questions. Use the additional teaching notes keyed to the textbook page numbers to help you prepare to discuss, review, preview, and reinforce important content. New OSHA hazardous chemical labeling requirements are included in Chapter 2. Additional explanations about electrical circuits are included in Chapter 4 to make learning this important topic easier to understand. New content on three-legged and low profile fuses plus smart junction boxes is included in Chapter 10. New content on immobilizer systems is included in Chapter 26. Deliver the most up-to-date standards content. All content in the book has been updated and correlated to the latest NATEF tasks and ASE areas. Present real situations. NewCase Studies in this edition include the “three Cs” (Complaint, Cause, and Correction) to reflect what is done in the real world in dealers and shops. Visualize concepts with full-color photos and line drawings. Over 60 new full-color photos and line drawings are included to make the subject come alive. The photos show the actual parts involved so that the student can view a good or defective part. The line drawings allow the reader to see what is inside a component and how it works. He has a Bachelor of Science Degree from Ohio Northern University and a Master’s Degree in Education from Miami University in Oxford, Ohio. Jim also holds a U.S. Patent for an electronic transmission control device. He is an ASE certified Master Automotive Technician (A1-A8), plus A9, F1, G1, L1 and L3). Jim is the author of many automotive textbooks, all published by Pearson Education. He has presented numerous technical seminars to national audiences including the California Automotive Teachers (CAT) and the Illinois College Automotive Instructor Association (ICAIA). He is also a member and presenter at the North American Council of Automotive Teachers (NACAT). Jim was also named Regional Teacher of the Year by General Motors Corporation and an outstanding alumnus of Ohio Northern University. Jim and his wife, Michelle, live in Dayton, Ohio. They have two children. You can reach Jim at jim@jameshalderman.com.